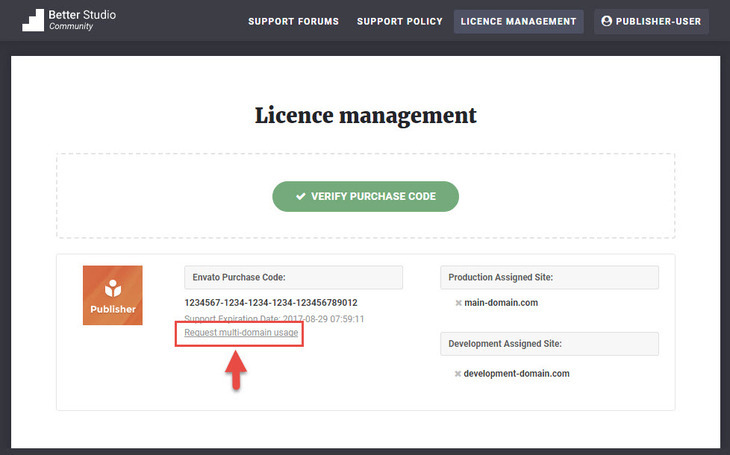 According to Envato laws, one license is for only one production site. You can read about these laws at Themeforest license standards and also ask your questions in Envato help center. We added support of multi-site just for using Publisher on other installations for categories and branches of your main site and using one license for multi domains is totally impossible and illegal. It’s not about us, it’s the rule of all ThemeForest themes. Registering multisite is a privilege that BetterStudio gives to dear users of Publisher. So we do not guarantee to accept multisite request unless it fully obeys below rules. “blog” could be anything in above examples but domain.com should be the same as your main domain. We refer to “sub-domain” and “sub-directory” as “sub-site”. 2- Every sub-site can have a different style and look but the branding should be the same in all sub-sites as the main one. Put it simple, you have one site and multi-sites are just branches of main site (for example sub-categories of it). 3- When we reviewing your request, we actually visiting your main and sub sites. So all these sites should be ready for visiting and confirming their consistent content and branding. Make sure your main site and all sub sites which you requested to use as multi-site, do not have any restriction in access like: directory password, Coming soon or maintenance mode. 4- All these websites (main and subs) should have some valid (not fake) content so we can review and validate them. We keep this right preserved for us to not accept one request and also the right to suspend one sub-site permission in the case we see violating above laws at anytime. 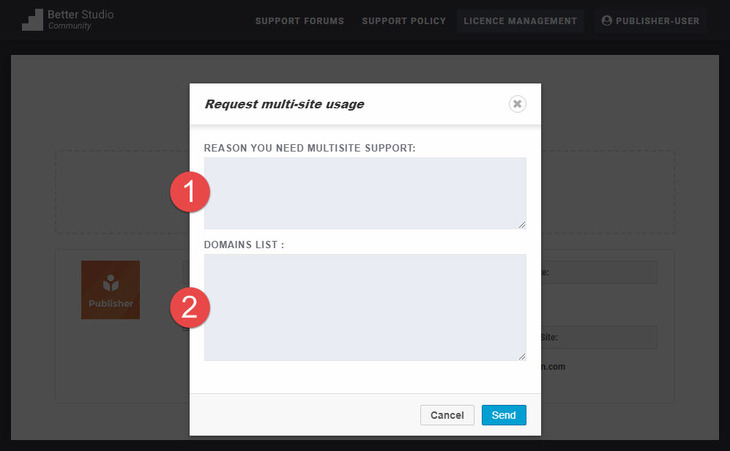 After reading and accepting above conditions, go to License Management page and click on Request multi-domain usage. 1- Now write the reason you want to use sub-site; for example: “I write about cars and bikes on my website and I want my bike reviewing pages have different look”. 2- Write all your addresses for reviewing. Write your full addresses, main and sub sites.